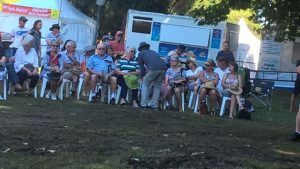 After a warm greeting by Tour Leader Bruce Drysdale (Principal of Trade Travel) and his wife Glenda, 27 Dalby Probus “hillbilllies” left Dalby at 7.00am on Friday 20th January 2017 to enjoy a Trade Travel organised trip to the Tamworth Country Festival. We travelled via Goondiwindi and Moree – it was an eventful trip from Moree to Tamworth as we travelled through a storm that sent several tree branches crashing onto the road. After a very enjoyable dinner at our Tamworth motel we were taken to Toyota Park for the Festival’s Opening Concert. Unfortunately, the weather was not kind to us as it started to rain heavily before we were able to walk from the bus to Toyota Park. The members who remained at Toyota Park were all like drowned rats – never been so wet. Day two started with a trip to the Golden Guitar Information Centre where we received arm bands that entitled our members to us the fleet of “FREE” courtesy buses during the free time that was at our disposal. This free time was appreciated by our members as it gave members the freedom to decide which show they would attend and the ability to enjoy the many buskers that performed in the main street during the two days. We all enjoyed the shows that were on offer at the many venues throughout Tamworth. Every Hall, Hotel, Bowling Club and The Services Club etc in Tamworth had country music shows all day and well into the night. The massive fleet of “FREE” courtesy coaches had several routes enabling visitors to travel to all of the participating venues as well as servicing the many hotels and motels in Tamworth. Courtesy coaches were available for all the routes every half hour. Day three started with a bus trip to Toyota Park where members enjoyed watching “Macca from Australia All Over” who was doing his Sunday Live Radio Broadcast on the ABC at the park. Three of our members were interviewed by “Macca” during this live broadcast – the photo attached shows Macca interviewing Dalby Member Barbara Just with members Carmel Vaughan and Errol Just to the left of Macca. At the conclusion of Macca’s broadcast, members again enjoyed free time and the music that was on offer. We spent an enjoyable two days at a very well organised Tamworth Country Music Festival and we returned to Dalby via Armidale, Glen Innes and Stanthorpe on day four. Probus President Yvonne Perry expressed the members appreciation to Trade Travel, Palmers Coaches and Club Tour Director Alwyn Shenfield.